We had friends visiting last weekend and took them to one of our favourite things to do in London: speeding down the Thames at 35mph on a boat. Like our first trip, my cheeks hurt from smiling so much. Last time we did the 40 minute 'Break the Barrier' route whereas this time we went for the longer 80 minute ride which starts at the London Eye and takes in 28 landmarks along the river before zipping out to Greenwich then beyond to the Thames Barrier and back again. 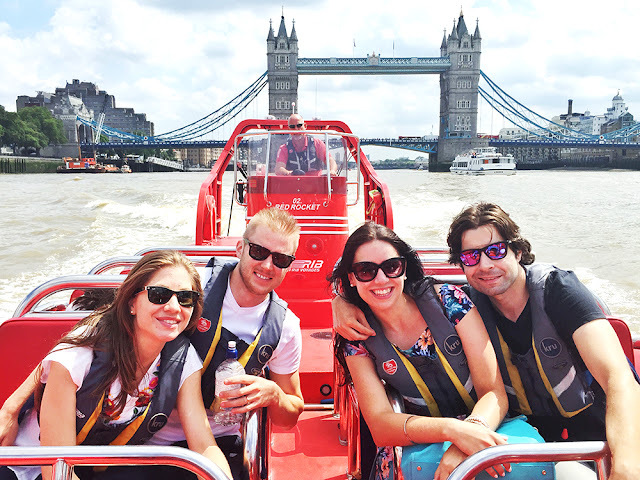 It's a great way for out-of-towners to see all the sights (the tour guides get the balance between funny and informative spot on), thrill-seekers to get the wind in their hair and it's a great tourist-in-your-own-city activity for Londoners too - I couldn't recommend a trip with London Rib Voyages enough.